The prow was as new, much as it would have appeared when slicing the North Sea on raids 1,000 years ago. It projected from the garden, the rest of the ship seemingly buried below. Morse advanced on it, his face a mask of panic and perplexity: ‘I'm sorry, Sir. I can't make head or tail of it. I'm fairly sure it must be some kind of rebus. Like countless others, I’m deeply grateful to Viking River Cruises for its patronage of the noble English art of sleuthing. I’d imagined that a Chelsea garden sponsored by the company would reflect its gift to television: a repro vicarage shrubbery from whose shadows protruded a pair of bloodied brogues; a conservatory where poisonous plants lurked, lovingly tended, among the fuchsias and begonias; a landscape that re-created some Death on the Nilelike journey, only with poplars instead of palms and titled ‘Red Danube’. Instead, and far better, Sadie May Stowell has designed a Scandinavian glade composed of conifers, sea-toned perennials, stones and water. From its heart soars the prow of a longship, acting as a pavilion. Of course, Morse was right: The Viking Cruises Norse Garden is an elaborate rebus for its sponsor’s name, brand image and cultural voyaging. And so was Thursday: there’s no mystery about its symbolism. But this garden is more than a massive 3D logo. It celebrates Norse heritage and wanderings, and it does so just as the hottest ticket in town is for ‘Vikings: life and legend’ at the British Museum. That exhibition’s curator Gareth Williams has given his blessing to the longship, praising the authenticit of the materials and techniques used by its makers, students at the Falmouth Marine School. Other details to admire include the stepping stones beautifully carved with runes by Simon Hudson, head stonemason at Hereford Cathedral. This design is one of the Artisan Gardens, smaller exhibits that, with the Fresh Gardens, have tended to be overshadowed by the Show Gardens on the Main Avenue. This year, several of them surpass the Main Avenue in interest and ingenuity. They’re smaller, yes, but no longer minor. They’ve come of age. Another in the Artisan class that deserves long lingering, The Topiarist’s Garden is Marylyn Abbott’s re-creation of a Hampshire gardener’s bothy. The building itself is charmingly down-at-heel; not so its frontage. Here, the imaginary occupant tends his most treasured plants in a paintbox of pots and square borders, all guarded by topiary towers whose layers range from staddle stone to Guggenheim Museum and gypsy wedding cake. Pastiche? Certainly. But it’s faithfully executed-artisan, indeed-and it captures that private love of plants and gardening that motivates most of us, but is too seldom celebrated. Not everything at Chelsea needs to be showy or innovative. If that’s your bag, however, there’s always Flora, Gucci’s exhibit among the Fresh Gardens. Inspired by the company’s fabric of the same name, Sarah Eberle has designed a courtyard traversed by a white catwalk. Immense bouquets stand at each corner and a changing plant display hangs overhead on chains modelled on Gucci jewellery. To my surprise, I’m all for it-it’s high time we revived the idea that something can be floral, bountiful, soft and, at the same time, chic. But then I may be biased. I’ve been gardening in the same Gucci loafers for the past 25 years- nothing like them for nifty footwork among overstocked borders. 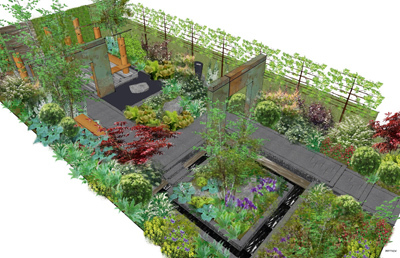 The Brewin Dolphin Garden by Matthew Childs combines archways, sculpture, columns, seats and water features with colourful foliage, its aim is to be a relaxing space, but will it succeed, with so much going on? 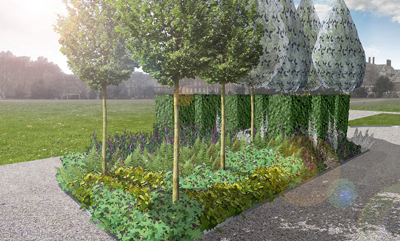 The Fresh Gardens also include the most horticulturally important exhibit at this year’s show, Cave Pavilion, designed by Sophie Walker and sponsored by the Garden Museum. Intended for a public space, it’s a giant sealed Perspex box clad in concrete except for a screen-like window. Inside, an artificially lit landscape of mysterious vegetation draws spectators like a video-link to the Lost World. The marvels that comprise this microcosm have been legally and sustainably collected in the wild by Sue and Bleddyn Wynn-Jones, two of Britain’s most prodigious living plant-explorers. These plants are all of horticultural value, many are hardy, and yet several are unknown not only to gardeners, but also to science. Here, displayed for the first time, are newly discovered species and a new genus. Cave Pavilion was inspired by Wardian Cases, the glazed boxes in which newfound plants were sent to Britain and desirable crops such as tea and rubber were distributed throughout her colonies. It’s a plea for the continuation of plant-collecting, not predatory but conservation-conscious, and a defence of horticulture’s role in discovering species, bringing them to the attention of botanists and offering them garden havens in which they can be studied, propagated and disseminated. Unlike Plato’s Cave, it conveys realities: we know most plants only because someone has collected them; we grow many that are gravely endangered in the wild-a plight for which horticultural collecting isn’t nearly so much to blame as other factors. Such plants are better off flourishing with us than consigned to oblivion by bulldozer and chainsaw or, if lucky, to dormancy until doomsday in a seed bank. You might ask why ‘with us’? Shouldn’t their home countries be responsible for conserving them? Of course, they should. But they tend to have other priorities such as logging, building, agriculture, dams, open-cast mines and so on. All of which needs saying as exotic species are under assault in Britain and, with them, the very character of our gardens and almost every plant that you’ll admire at Chelsea this year. With a chauvinism they’d soon call racism if it were dealt to foreign people, evangelical Greens have taken to decrying the non-native elements of our garden flora (more than 90% of it). More worrying still, to protect us from the possibility of alien species becoming invasive, the European Parliament has passed legislation that will rob us of the freedom to determine our national flora, wild and cultivated. Among the measures proposed, any new plant introduction would be detained by EU inspectors for risk assessment before being granted leave to remain or being incinerated. Had such an inquisition been in force before, Britain would never have achieved her horticultural glory and botanical eminence, her unique status as the world’s garden. Cave Pavilion is a timely reminder that to grow is to conserve as well as to enjoy and that the plants most in need of our ministration are often found beyond our shores and Europe’s incontinent borders. This has turned rather solemn and so it must continue for a while. Make no mistake, Chelsea 2014 is a joy, but it is also unusually serious and reflective. That’s only as it should be in a year that sees the centenary of the outbreak of the First World War and the ending of a more recent British engagement. Both conflicts resonate in No Man’s Land, the profoundly moving Show Garden created for ABF The Soldier’s Charity. Its designer, Chelsea newcomer Charlotte Rowe, has conjured the landscape of the Western Front as it has changed down the years since the guns fell silent-the trenches overtaken by sward and woodland, the craters turned to life-teeming ponds the installations now as mysterious as the most ancient ruins and earthworks. Here, the landscape is seen as a metaphor for the body. The point is not to obliterate the memory of war, but to articulate time’s and Nature’s roles in healing its wounds. 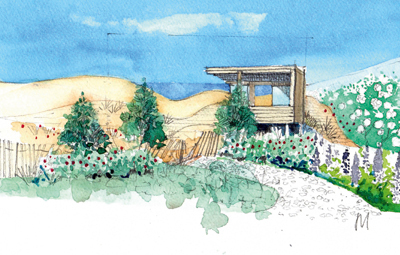 In another Show Garden, Hope on the Horizon, designer Matthew Keightley presents an allegorical terrain that enacts the recovery process undergone by personnel who have sustained injuries or illnesses while serving in more recent conflicts. It is a powerful vision, a progress from chaos to structure, from dark, rocky and hostile to bright, tranquil and hopeful. It’s also a magnificent illustration of something that’s becoming increasingly apparent among veterans, their families and helpers: gardens are not just for remembrance, but also for active therapy. 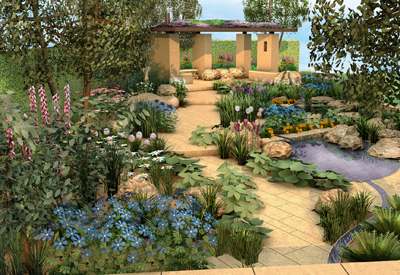 After the show, this garden will be moved to Chavasse VC House in Colchester, one of four recovery centres run by its sponsor, the charity Help for Heroes. For a different prospect of contentment attained, ponder The Massachusetts Garden, sponsored by that august commonwealth’s Office of Travel and Tourism. Designers Catherine MacDonald and Susannah Hunter have taken their cue from Cape Cod’s summer retreats. Huddled among the dunes, many of these houses sport dazzling gardens, cottage in style and scale and filled with annuals, herbaceous perennials and tumbling roses. Venerable by American standards, some of them have risen socially in their long descent from whalers’ widows to artists and intellectuals, politicians and plutocrats. And yet successive owners have wisely preserved their homely and jumbled charm. In their quilted riches, these oases contrast vividly but entirely happily with the sere tones of the surrounding sands and coastal flora. It’s a contrast that the Massachusetts Garden brings brilliantly to life. It’s also a recipe worth trying for anyone with a cottage by the sea in old England-better by far than dreary but incongruous Torbay palms. Growing as if wild among the exhibit’s dunes are several USA natives that deserve to be better known in our gardens, coastal or inland. Look out for the dear little beach plum (Prunus maritima), American marram grass (Ammophila breviligulata), bearberry (Arctostaphylos uva-ursi)-an invaluable evergreen carpeter for acid sand-and Opuntia humifusa, a bone-hardy cactus whose low-borne pads are studded with golden flowers. At least two of those are potentially invasive, but you’ll know how to contain them, being a proper gardener. Plants for the Massachusetts Garden have been grown by Kelways, the Somerset nursery that has been exhibiting at Chelsea ever since the show’s inauguration in 1913. Floods notwithstanding, this year is no exception. On its stand in the Great Pavilion (GPE19), Kelways is displaying six intersectional peonies. Hybrids between tree and herbaceous peonies, they combine the elegant foliage, colour range and spectacularly ruffled blooms of the former with the vigour, extended season and disease-resistance of the latter. As yet, they’re rare and much sought-after and priced accordingly. But they’re worth it, as is soon confirmed by a longing glance at the peaches-and-cream Paeonia Singing in the Rain or at P. Hillary, dressed to kill in raspberry taffeta. Other new plants on display in the Great Pavilion include Chrysanthemum Martin Bell (Chrysanthemums Direct, GPE8), hardy and massed with sprays of single, white, daisy-like flowerheads; Hosta Andy Murray (Brookfield Plants, GPF6), with leaves variegated in pale blue, white and gold in tribute to the Scottish Saltire and the sportsman’s trophies; Eryngium Neptune’s Gold (Hardy’s Cottage Garden Plants, GPD12), a sea holly with aureate leaves and floral bracts; and Rosa The Lady of the Lake (David Austin Roses, GPB6), a ravishing repeat-flowering rambler with sprays of semi-double blush blooms. These are just a very few of the throng of debutantes presented at this year’s Chelsea. Britain’s gardens grow ever richer and it will take greater forces than eco-puritans and Eurocommissars to stop them. Scarce and irreplaceable, ancient woods support our rarest and most vulnerable species, dependent upon characteristic flora, old trees, deadwood and the associated fungi, insects and microbes that take hundreds of years to evolve and consolidate. The Woodland Trust’s important exhibit (GP Discovery Zone) demonstrates why it’s impossible to replicate such ecosystems by the simplistic suggestion of planting new trees elsewhere (as is proposed by the Government, where ancient woods are being condemned by HS2 and other development projects). Amaryllis at Warmenhoven (GPB15); begonias at Enterprise Plants (GPD6); gladioli in great variety at Pheasant Acre Plants (GPH15); lilies at H. W. Hyde (GPB7) and at Harts (GPG5); heliconias, torch lilies and anthuriums at Barbados Horticultural Society (GPF12); and Thai orchids at Pattaya City & Nong Nooch Tropical Botanical Garden (GPD18). Choice small species at Avon Bulbs (GPE13); a remarkable range of daffodils at Walkers Bulbs @ Taylors (GPE5); fritillaria and unusual bulbs at Jacques Amand (GPG10); and tulips in a multitude of hues at Bloms (GPG4). The Butterfly Effect, by Our Planet with Clive Farrell (GP Discovery Zone), celebrates our precious butterflies in ‘an immersive, 4D experience’. Its imaginative documentary presentation focuses on the crucial role Britain’s bestloved insects play as garden pollinators. Do come and visit our COUNTRY LIFE stand in association with Cavendish Stone, at the top of Main Avenue (RHW10). The attractive display features low hedges and soft planting from Coblands nursery, providing a sumptuous leafy background to the stone sculptures. 175 years: Perennial, the Gardeners’ Royal Benevolent Society (GPG9). 150 years: Hillier Nurseries (GPD 17), celebrating with the launch of the essential 8th edition of The Hillier Manual of Trees & Shrubs, several new plant introductions and Jean Hillier’s engaging saga Hillier: The Plants, The People, The Passion. The Williams family of Caerhays, Cornwall, and its Burncoose nursery celebrate the family’s long-time sponsorship of plant exploration and the richness of Far Eastern flora. With its own remarkable collections, it celebrates the treasure trove of garden plant material gathered a century ago by intrepid explorers George Forrest and Ernest Wilson. Hercules Haddonstone’s collaboration with the Sir John Soane’s Museum unveils a collection of replicas cast from the museum’s remarkable hoard. It includes a bust of the Farnese Hercules, a caryatid statue, a term or terminus statue and a Roman ‘mouth of truth’ mask. Tiny plants for troughs at D’Arcy & Everest (GPH17), alpines in pots at Harperley Hall Farm (GPF8), auriculas in variety at new exhibitor Drointon Nurseries (GPF20) and cascades of ripe strawberries tumbling from pots at Ken Muir (GPB11). Paper trails The Paper Chase (GP Discovery Zone), from Huhtamaki with Sparsholt College, explores paper manufacture and a range of supply plants, including eucalyptus and pines. All the exhibit plants are growing in compost made from recycled paper cups. Will be everywhere this year, commemorating the centenary of the First World War and John McCrae’s In Flanders Fields. SANBI Kirstenbosch (GPB18) displays the nation’s remarkable wildflowers in a naturalistic setting; City of Cape Town (GPD24) puts the colourful flora of the Cape into an urban garden setting. The Wilverley Idler is a classic country garden sofa on a swing that lulls you to sleep on balmy afternoons; Sitting Spiritually’s Heart Back handmade wooden seat swing, designed with Arts-and-Crafts specialist Paul Reeves, celebrates the company’s 10th anniversary.